Gotham Volleyball is proud to announce that it will be presenting “Spring Fling X,” a NAGVA-style tournament run by Gotham Volleyball for beginner/advanced beginner players in Gotham Divisions 7-10 and PowerPlay, as well as those intermediate players at that level who are looking to transition toward NAGVA tournament competition. Consider joining us to help make this 10th Spring Fling the biggest and best yet! Spring Fling X will held the weekend of May 18-19, 2019. It will be a two day tournament, with the first day being round robin play and the second day being a double elimination tournament. The entry cost will be $415 per team of up to 7 players, with $60 each additional player. A smaller division, known as The Intermediate Division is designed for those Intermediate players in Divisions 7-10 who wish to transition toward higher levels of play, including NAGVA completion. Our main division, known as the “Green” Division is designed for those beginner and advanced beginner players who want to experience tournament play. In order to be eligible to play in Spring Fling X, the player’s most recent Gotham Division must be Division 8-10 and Power D & E. Most Division 7 players are also eligible with important exceptions and exclusions noted below. All participants in our PowerPlay program as well as level-appropriate participants in Power W are also eligible. However, in the “Intermediate” Division, each team may have up to two “transitional” players who currently play in Divisions 4-6, otherwise ineligible Division 7 players, or Power B-C.
Non-Gotham players (players who have not participated in League or Power within the past 3 seasons) are eligible to play in the Green Division, but first must be evaluated by designated member of the Tournaments and Open Play Leadership Group in a Friendship Tournament or open play. Only non-Gotham members playing at the skill level of a variety of our beginner/advanced beginner Divisions are eligible to play. In the “Intermediate” Division, non-Gotham players who have active NAGVA B ratings may play as one of the team’s transitional players. Registration for Spring Fling X will open at 6:00 AM on Monday, April 15, 2019. Please note that the Transitional Division is smaller and is expected to close quickly. Note: Registration is a two-step process. First, you must fill out the registration form. You may only pay for your team after you fill our the registration form. If you pay without registering, your payment will be disregarded. A team will only secure its spot in the tournament after it has registered and paid. Pool play will be held on May 18. Seeding Party & Gotham End of Season Party – all Spring Fling participants are invited to the Gotham End of Season Party. The Spring Fling seedings will be announced there! Double elimination tournament play will be held on May 19. MVP, All Star, Rookie of the Year and Team Awards will be given out directly after tournament play (approx 5:45 PM). Q: How does a “NAGVA-style tournament” work? A: It’s a fun, full weekend of volleyball! Saturday is round robin play. You play four other teams in 2-game matches similar to a Friendship Tournament. The second day is a double-elimination tournament with seeding determined by the success of teams on the first day of play. Seeding will be announced at the Gotham End of Season Party. You keep playing Sunday until you lose two matches or win the championship!!! At the end of the tournament, awards will be given to the top 3 teams in the tournament. Awards will also be given out for Tournament MVP and All Stars. Q: Are team uniforms required? A: Uniforms are not required, but all players on a team need to wear shirts of a common color or design. Q: I want to play in Spring Fling X, but I don’t have a team. What can I do? A: If you don’t have a team and you are playing in Gotham Division Play or Power, we recommend checking with teammates or friends in your division/power class to see if you can get a team together. 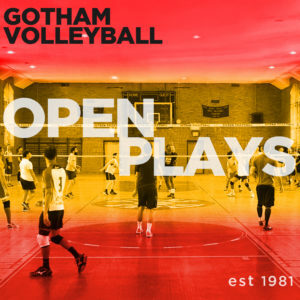 If you are struggling to find a team to play on, you can try and find a team using our Gotham Volleyball Team Up group, but we can’t guarantee that you will be placed on a team. Q: Do I need to play in Gotham Division Play and Power to participate? A: No. The tournament is open to all players, although we strongly encourage the use of Gotham-rated players. If you have never played in Gotham Division Play or Power, NAGVA or have not played in any of these places during the last 3 seasons, or if you returned to Division 7 this season without trying out for higher Divisions, you will need to be evaluated for eligibility by coming to a Gotham Friendship Tournament or Open Play prior to Spring Fling X. In evaluating eligibility, the tournament staff will only permit non-Gotham players whose skill level would place them in a variety of our beginner/advanced beginner divisions. Non-Gotham players whose skills are comparable only to the better players of the highest division at each level will not be permitted to play. Q: Are there exceptions to the rule that only people who most recently played in Division 7 or lower and Power D or lower can play in Spring Fling X? A: Yes, but only for the Intermediate Division. In that Division, teams may have two “transitional” players who play at a higher level. Eligible “transitional” players are those players in Gotham’s Division 4-6, Power B-C, Team Power B and non-Gotham players with an active NAGVA B rating, as well as Division 7 players who returned to Division 7 without trying out for higher Divisions and are determined to be ineligible for the “Green” level. Q: Can players who play in Power A-C but Division 7 or lower, or players in Divisions 1-6 but Power D or lower play? A: No, except for the “transitional” player rule discussed above. If you have played in both Gotham Division Play and Power during the last 3 seasons, your most recent level must be BOTH Division 7 and lower AND Power D and lower (including PowerPlay) in order to be eligible. If you have a player in this category, consider playing in the Intermediate Division and making this player one of your transitional players. Q: I was in Division 7 (or higher) and Power D (or higher) prior to this Spring. Can I remain/become automatically eligible for Spring Fling X by not trying out for higher Divisions or Power classes in Spring 2019? A: No. Players who return to Division 7 in the Spring because they chose not try out for anything higher and players who “drop” to Division 7/Power D or lower in the Spring by not trying out for the higher level they previously played in will need to be re-evaluated by the rating committee in order to determine whether they are eligible. This determination will be made on a case by case basis by the tournament staff. Q: What about Team Power? A: Participants in Team Power B who are currently playing in Gotham Division Play and/or Power and would otherwise be eligible if they didn’t play in Team Power are allowed to play in Spring Fling X. All other participants in Team Power B can play as a transitional player in the Intermediate Division. Team Power A/BB participants as well as all players with NAGVA BB or higher ratings are not eligible to participate at any level in Spring Fling X.
Q: What about Power W? A: Level appropriate Power W players are eligible to participate in Spring Fling X. If the player participates in League or Power A-E or PowerPlay, the same eligibility rules apply. If the player does not also play in Division Play or Power A-E or PowerPlay, the Tournament staff will consult with the Power W coaches to determine if a Power W player is level appropriate. Other Questions: If you have any other questions, please e-mail the Spring Fling IX Tournament Director at [email protected].